Racing the Moon by Alan Armstrong. Review: Have you ever snuck into a very heavily guarded rocket building facility? Have you tried to fly a plane and crashed into a river? 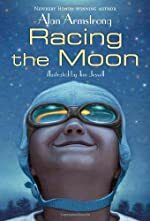 You will want to read about the adventures of Alex and her brother Chuck in Racing the Moon by Alan Armstrong. Alex is an adventurous and daring young girl, and she has a brother named Chuck. He is naughty, mischievous, and he always gets into trouble. He enjoys climbing radio towers and messing with school microphones. The story starts when Alex goes to the new neighbor's house to sell plants. The neighbor, Ebbs, invites her inside and gives her a bomber bar that she invented for people to pilot bomber planes. Alex sees pictures of Ebbs with rockets next to a German scientist. Alex becomes curious and asks Ebbs about the picture, and she excitedly tells Alex that she made food for astronauts. After that, Alex and Ebbs become good friends. Later on, Ebbs sails a boat named the No Name and she invites Alex to go on a sailing trip to Tangier. When they arrive, Alex hears of Wallops, a secret facility where rockets are launched. Alex finds out that she can get there on a mail boat, and decides to go there. She sneaks on the mail boat and hitchhikes with a guy named TJ to reach the facility. You will want to read the book to find out what happens next! Racing the Moon is a great story that I think young adults and children would like to read. I think it is appropriate for all because it is funny, happy, suspenseful, and has a satisfying ending. We would like to thank Random House for providing a copy of Racing the Moon for this review. Have you read Racing the Moon? How would you rate it?